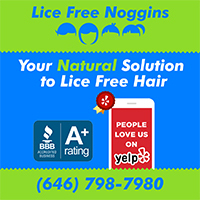 At Lice Free Noggins, a professional mobile in home head lice removal treatment service in Queens, NY, all of our highly trained Lice Treatment Specialists are experts when it comes to head lice treatment and nit removal. Our highly trained staff will not only end the cycle of head lice but also provide you with the education and hands on training needed to prevent future outbreaks. What makes Lice Free Noggins the preferred lice treatment service in Queens? Attempting to get rid of head lice on your own can be a very trying experience. What makes Lice Free Noggins stand apart from other lice removal companies is that our Lice Treatment Specialists have a passion for the head lice removal services which Lice Free Noggins provides. Our Lice Specialists will quickly and accurately screen all household members and treat those, which are affected, in a thorough and efficient manner using products which are natural, eco-friendly, and pesticide free. Get rid of lice naturally in just one appointment. Queens, NY’s #1 Professional Head Lice Removal Specialists! Getting rid of head lice does not have to be a stressful experience. We offer best lice treatments for adults and kids. Chemical-free, safe, effective, and fully guaranteed lice treatment service. We have successfully treated thousands of families in Queens and we can help yours today! In-Home Lice Removal Treatment Service In Queens, NY. We've treated over a thousand families in Queens. We focus on providing the highest quality service by following a standardized lice removal system. Our lice services are quick, pain free, competitively priced and NO Travel Fees! Was treated by Lice Free Noggins today for a lice scare fabricated by another lice company. LFN came to our house and inspected both my fiance and me only to find..no lice! Service was very pleasant, knowledgeable, and professional and the fee was well worth the peace of mind. Definitely recommend. Thank you Lena & Sarina! Quick service, was able to get an appointment within the same day! & Catherine was very nice, took her time & addressed all questions/concerns. I would definitely recommend them. Thank you, guys, for the quick and effective treatment! It was very easy to make same day appointment. The professional (Serena) was amazing. Will definitely recommend! My girls and I were blessed with extremely thick and curly hair. I was always horrified at the thought of having lice. I wouldn’t even know where to start. When we received a call from Anne’s teacher, I knew that I couldn’t face this on my own. Lena, from Lice Free Noggins, was very reassuring and put my mind at ease. She came to our home in Forest Hills and spent several hours treating and checking my girls and I. We just had a follow up appointment and are glad to say that we are lice free. We scheduled an appointment at 7 am and had a lice expert at our home within the hour. After treatment I was able to take my kids to school and make it to work. Outstanding service! Melaina was amazing with my grandchildren who both had nits. She was friendly and helped me better understand how to prevent lice in the future. My son was sent home from school due to head lice. We attempted to treat with Nix but, apparently, it didn’t work for us. After doing numerous amounts of laundry and daily combings for a week, we felt overwhelmed. Our neighbor told us about an in-home service they have previously which would come to our home in Queens. We called Lice Free Noggins immediately and were able to schedule an appointment for the same day. The treatment was so thorough and we were explained how to prevent future infestations. Wish we found out about them earlier. I remember the horror I felt when I discovered my kids (4 y.o. and 6 y.o) had lice. After trying to treat it (3 times) with over the counter stuff, unsuccessfully, I gave Lice Free Noggins a call. Lena was able to offer us same day appointment. I was very pleased with the visit. I got an "after care instructions" email, as promised. While, I hope we don't have to deal with lice in the future, in case, if we do, I would use the services again. I would highly recommend it. Lice Free Noggins is an amazing company. My oldest daughter had come home from school with lice and I thought I could treat it myself so I gave it a shot. All that it resulted in was me spending a lot of money on products and my other daughter also getting lice. We are a family of long haired girls so I was in a panic, until another mom recommended this company to me. Someone came out right away, and they are great with working with kids. My girl's gave me so much trouble when I tried to treat their hair but the woman who came out was able to keep them calm and entertained the entire time! They even checked my head to make sure I was in the clear and followed up with us to ensure our pest problem was taken care of. I'm really grateful to Lice Free Noggins, they took a situation that was a nightmare and handled it like true pros. It seems like there is a huge lice outbreak in my children’s school in Queens. We had lice checks done in school and almost every classroom had a positive case, including one of my daughter’s. We hired Lice Free Noggins and are very happy with the service. A lice removal professional arrived shortly after scheduling an appointment and treated my child. She also checked my other daughter as well as myself and explained how to check my husband, since he was not home. So happy that such a service exists. I highly recommend this service! I tried everything on the internet to treat my daughter for lice, but they kept coming back! Nina was incredible and did an all natural treatment in just one session. Wish I knew about Lice Free Noggins right away and saved myself the hassle. Professional in-home head lice removal and head lice treatment service in Queens, NY. We offer a safe and effective head lice removal treatment for your entire family. Our lice treatment products are natural and non-toxic. We guarantee to eliminate your family's head lice & nits in just one visit. Flat rate pricing and NO travel fees!